Big Fiddle and Stoney Cross are declared in the mares novice hurdle at Wincanton tomorrow. Snow is forecast so participation is in the lap of the gods. It will be frustrating if the meeting does not go ahead as we are keen to get a run into both mares. Big Fiddle has shown promise in bumpers and is from a very decent National Hunt family. Whilst Stoney Cross is also a well-bred mare who unfortunately came down two out in her first novice hurdle. However both have schooled well and it will be good to get them back on the track. It was great to welcome Camilla and Henny this morning to come and see the unnamed three year old Helmet filly (pictured) go through her paces. 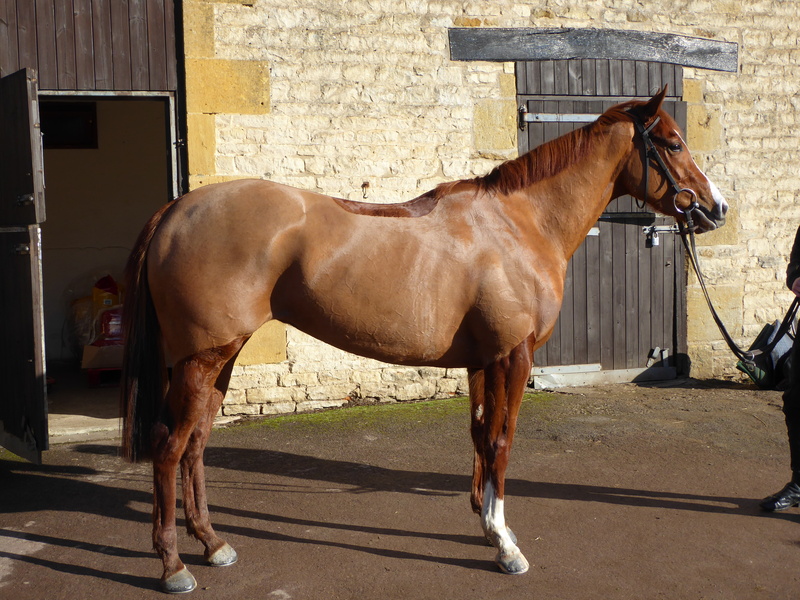 She is a bonny type who is strengthening up nicely over the winter and will hopefully give connections a lot of excitement this coming flat season. She has a nice pedigree and a great attitude. Pricewise today goes through the RSA Chase and his selection is Topofthegame who appears to be a very good chaser in the making. However I’ve always been a fan of Vinndication ever since I saw him in the paddock at Ludlow in his first bumper and it will be interesting to see him take his chance. Whilst Ok Corral should be in the mix should he go for this and not the four miler. Possibly the best value is Mr Whipped each way at 33-1 – he looks to have a lot of ability and the three mile trip should suit and he beat Paisley Park in a Grade 2 at Warwick last season.